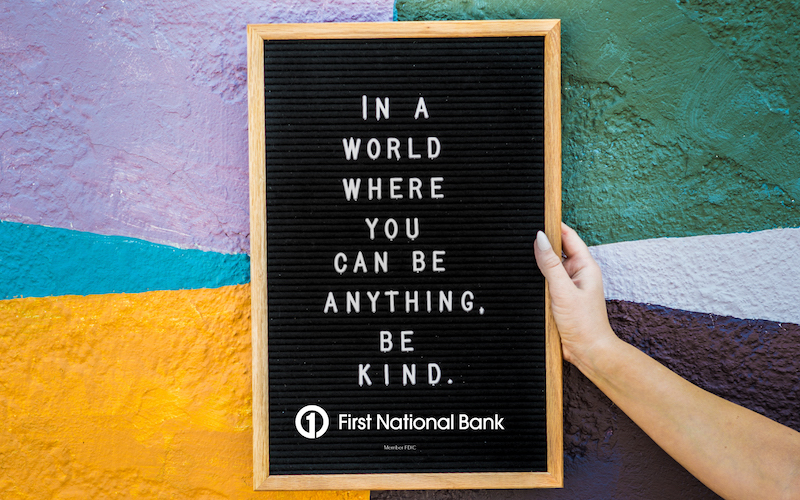 Here at First National, we believe it's cool to #BeKind. So much so, in fact, that we're putting our money where our mouth is. This year, we’re supporting the city-wide #BeKind campaign by partnering with schools and educators across every district and all grades to Spread Kindness Daily. And we’re rewarding students and teachers who join the challenge! Starting today, we want to see your stories about people who embody the #BeKind movement — share a post, photo, or video nominating your friend or teacher who spreads kindness daily with us, and be entered to win weekly prizes. Even better, at the end of the year, we’ll randomly select one student and one teacher to win a scholarship and a grant provided by First National Bank! How do you enter? Easy! Share your nomination in a social post on Facebook, Twitter, or Instagram with the hashtags #BeKind and #KindnessisFree. Kindness is free. Let’s spread it, Omaha!